Hello lovely people, We just decided to open our best picture thread as we thought it was about time to please UK420 users with some great pictures of our strains. This thread is meant as a friendly competition too, meaning that we will reward the best pictures with some interesting prizes. Each month, starting from March, we will pick up 3 winners among those who submitted pictures. First round goes from today until the end of March. We will announce the winner in the beginning of April. Prize: 2 x 4-packs of your choice Various goodies (we'll let you know in the near future) Share your beauties with us, we’ll have some fun Stay High, Mr B from Female Seeds Ps: it’s our first time running this contest, so feel free to contact us if you have any suggestions or feedback. WINNERS Seedsman Forums Battle 2018!! Hey bros & sis .. we are going with what you are wanting..:woohoo: Judges: JTrich & StRa Ratings: Regularity, quantity / quality photos, plants & info. It really has been a difficult choice because of the great diversity of all the jobs, so after the first vote we have achieved different tops even coinciding in many of the positions assigned. So after much debate we decided that everyone who was on both tops should be awarded, so here is the result. We hope you like it and congratulate the winners .. Great job guys !! INDOOR 4th Arthur 5th Brunch & Ciumbia+ 6th Pablo69 7th EasyT & AND OUTDOOR FORUMS DETAILED INFO & STATS INDOORS 1st place for CityDweller from THCtalk with: CBD Cream and Cheese, Amnesia fast & Black Sugar 2nd place for Paddi from ICMAG with 3 threads: Power Africa Fast Fem, Velvet Bud & California Orange 3rd place for Shakì7 from ICMAG with: Candy Cream & Blueberry 4th place for Arthur from UK 420 with 2 thread: Narkush; Original Afghani, GSCrack, Cheese & C99 x Blueberry fast 5th place for Ciumbia+ from ICMAG with: Power Africa x MkUltra Fast, Big Nugs fast & Mama Mia 5th place for Brunch from ICMAG with 2 thread: Power Africa, Girl Scout Crack 6th place for Pablo69 from THCtalk with 2 thread: Candy Cream & Big Nugs FAST 7th place for AND from THCtalk with 2 thread: Mama Mia California Orange 7th place for EASY T from THCtalk with: WitheWidowAUTO OUTDOORS 1st place for stayup4ever from UK 420 with: Original Skunk Fast, C99 x Blueberry, Big Nugs Fast 2nd place for SpaghettiFunk from ICMAG with 2 thread: Auto Onyx and MamaThai 3dr place for Pillang from ICMAG with: Lowryder#2Auto FORUMS Special prize for all ICMAG participants ending his threads with a right regularity Pillang MrBrunch PersonalProvide Paddi SpaghettiFunk secco Truzzo Ciumbia+ Shaki7 We judged 33 indoor threads and 10 outdoor that we selected from all contest thread opened & finished during 2018! 25 threads from ICMAG 13 threads from THC talk 5 threads from UK 420 Special thanks you all participating!! 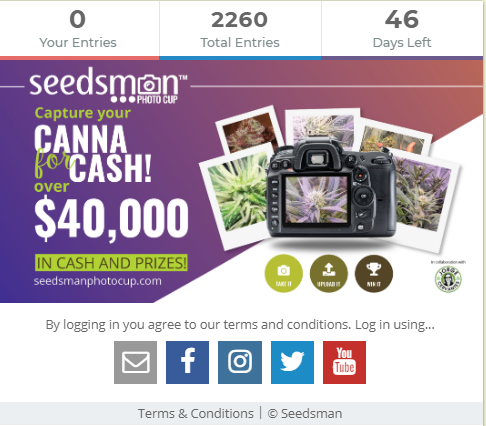 Seedsman wants to give you a sneak peak to the Seedsman Photo Cup – officially going live on Tuesday 26th! The “Seedsman Photo Cup” is one huge Photo Competition – with two great ways to win and take your shot at over €40,000 in cash and prizes! “Judges’ Cup” winners will be selected by a panel of experts led by world renowned cannabis cultivator, writer and expert Jorge Cervantes. Winning photos will be selected by our experts based on image quality, lighting, composition, setting and creativity as well as the quality of the plant. “People’s Cup” winners will be determined by the most votes from your own fellow growers and enthusiasts, family and friends! 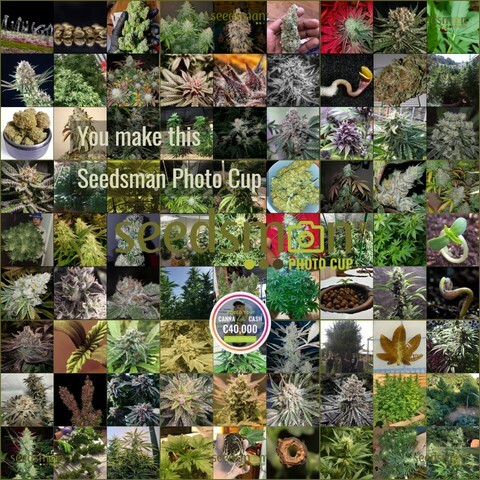 The pics in the Photo Cup Gallery receiving the highest number of votes will win great cash, vouchers, seeds and more! Share the Competition with all your friends and family – get them to vote – and you too could be one of Seedsman’s big winners! 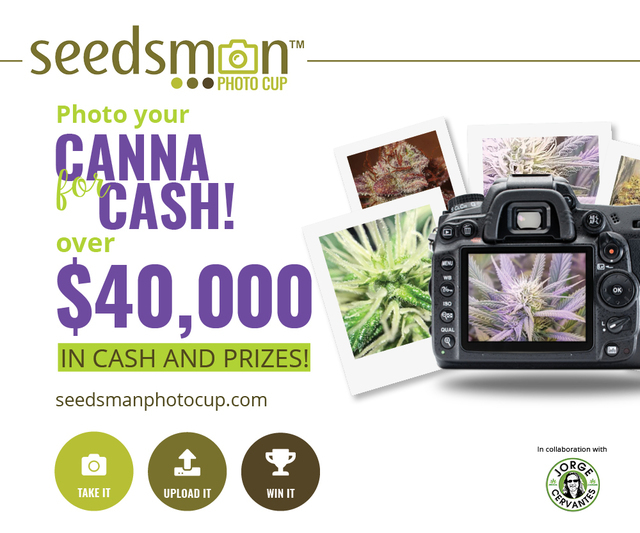 Go to www.seedsmanphotocup.com for all Seedsman Photo Cup details and enter your best pics to win!! Seedsman Photo Cup. Are you already participating? Do not wait any longer or you will be left behind !! Hey buddies, this year we have organized a big contest for all those instagrowers, I know some of you do not want to share in Instagram, so I'm sorry, this contest is not for you, wait for the next.. :comfort: Structure #seedsmanshotcup2018 11 months / rounds + Final in December 2 winners each month & 2 winner Final cup € 1200 in prizes Monthly prize: 3 Seedsman Collections to choose + 1 Medical marijuana Genetics to choose (30 seeds) Final cup prize: € 250 to spend at www.seedsman.com How to enter: You needs a public instagram account & follow us at @seedsmanseeds Shots have to be from Seedsman genetics or breeders we sell Post each shot with tags: @seedsmanseeds # seedsmanshotcup2018 #NAMEstrain #NAMEbreeder (where "NAME ..." put real names) max. 5 shots/month We repost your shot in the next hours Winners are chosen: one from "repost" LIKES & one from Seedsman Crew Any questions let me know.. Play & enjoy.. Good luck!! Photographic Contest ★ Sweet Seeds ★ FaceBook ➲ send the pictures to this email: WeLikeSweetSeeds@gmail.com 1.- Organizing company Sweet Seeds S.L., with head office in C/ Rev. Jose Mª Pinazo, 9 46020 Valencia with CIF B-97811616, runs a PHOTOGRAPHY CONTEST with plants of any genetic from Sweet Seeds. 2.- Disengagement regarding Facebook Facebook does not sponsor, support and does not manage in any way this promotion and its not associated with it. The user completely disengages from Facebook and is aware that the data is being provided to Sweet Seeds and not to Facebook. The provided data will be used to process the contestant participation, to inform the contestant of eventual prizes and with commercial purposes if the organizer decides, meaning that Sweet Seeds reserves the right to use some of the published pictures in catalogs, articles or other type of promotional actions. 3.- Object, mechanic of the contest and prizes Monthly photography contest, where the best 3 photos which adapt to the monthly theme win a prize. To decide the winners we will evaluate the photos that fit in the monthly theme, but also and as important, the technique and quality of the picture. You can participate with as many pictures you want, as long as the criteria and contest rules are respected. In each month only one of your pictures can be chosen for one of the first 3 prizes. There will be 1st, 2nd and 3rd Prizes. Besides that there is also a Public Vote Prize for the picture with the higher number of Likes at Face Book, receiving a prize of 200 euros in seeds. Prizes: 1st 200 euros in seeds 2nd 100 euros in seeds 3rd 50 euros in seeds. Public Vote Prize 200 euros in seeds Conditions to participate: 1 Click the Like button in the Face Book Sweet Seeds page to be follower and to share the contest information in your Face Book page. 2 You have to be an adult in your country (18 year old or older). 3 Fit into all the mentioned criteria, presenting only pictures of Sweet Seeds plants according to the monthly theme. To participate, send us your best pictures of any plant(s) from Sweet Seeds between the 1st and the 20th of each month to the email address WeLikeSweetSeeds@gmail.com and we will publish the pictures in our Face Book page. By the 25th of every month the winners will be announced and the theme for next contest will be published. To determine the winner of the Public Vote Prize we will consider every Like received until 23h59m59s of the 24th of every month. If 2 or more pictures have the same number of Like, it will be the Sweet Seeds team to decide which picture should win this prize. Important: the picture must be an original, it cant be a picture that was previously a winner of a prize in other contests. It cant also be a picture previously published in a professional format of any media, including electronic media, with the exception of social networks of personal use. We also ask you to send us the picture with the best quality and bigger size possible (minimum accepted is 1800 x 1200 pixels). We also ask for a clear file name and it should be like this: Strain name FaceBook username of the contestant Contest nº x Example: Green Poison John Parker Contest nº 1 The inadequate participations will be eliminated, just like any other participation that Sweet Seeds considers unadjusted to the established in this bases. The participation in the Contest supposes the cession and express authorization of all the intellectual property (copyright) and the rights of image for all the participations, with this meaning that the contestant cedes to Sweet Seeds the rights of exploitation of intellectual, industrial and/or image nature that belong to the author of the picture used to participate in the Contest. 4. Range and duration The Contest starts by the 1st of December of 2013 and its a monthly contest available to every country in the world. Sweet Seeds reserves the right to decide the number of editions (months). 5.- Requirements to participate This Contest is available for: - All the persons with 18 years or more who are fans of the official Sweet Seeds page at Face Book and who have a real profile page at Face Book. On the other hand, all users of cannabic forums where Sweet Seeds has a subforum can send the pictures by email and share them in the Sweet Seeds subforum, and be a candidate to all the prizes except to the "Public Vote" prize (as it can only be applied to contestants with a page at Facebook). 6.- Election of the winner/winners, substitutes, communication, prizes and prize delivery Between all the pictures received, a jury composed by members of the Sweet Seeds team will choose the 3 winning pictures, based on originality, quality and on how good the picture fits the theme. Between all the pictures the Public Vote Prize will go to the picture with more Likes at Face Book before the finish date. This prize can accumulate with the other prizes. This means that, as an example, if a picture that won the 2nd place is also the picture with the highest number of Likes, then the author of that picture will win a total of 300 euros in seeds (100+200). If for any reason the winner gets unreachable and we cant contact him/her in a period of 15 days counting from the first attempt of contact, or if the winner renounces the prize, it will not be given and the amount of money in seeds will be used in the prize of the next contest presented, improving the prizes for that month. Additionally, the name of the winner will be announced in the Sweet Seeds Face Book fan page and through email or private message, as soon as the Contest finishes and during the following 24 hours. Sweet Seeds will send the prizes directly to the winners, who have to share a name and an address for that matter. Sweet Seeds denies any responsibility related with deliveries that dont reach the addressee due to mistakes in the given address o if the contestants send a fake name. The prizes will be sent by mail to the address shared by each winner and the shipping costs are covered by Sweet Seeds. The difference between the value of the prize and the total value of the chosen seed packages will be considered lost and Sweet Seeds will not cover it in any way. Example: if a winner of the 2nd prize asks for 4 packs of seeds and the total value is 97 euros, the 3 euros of difference (100-97) are considered lost. The prizes will be sent in a maximum of 30 days after the winner claims it. All the strains available for this contest are Sweet Seeds originals. 7.- Warnings and limitations We will consider, on an illustrative but not limitative way, that a fraud is produced when we detect a use of applications that are external to the Website; the procedure of an abuse of enquiries to the server and all the behaviors that can result apparently abusive and/or malicious. The verification of any of the previously mentioned circumstances during the contest would mean the automatic disqualification of the contestant and also the loss of the award/prize given. Sweet Seeds declines any responsibility related to errors on the details given by the winners that could impede his/her identification or the delivery of the prizes. On the same way the company is not responsable for any possible losses, damage, steals or any other circumstance imputable to the mail service/office that could affect the shipping of the prizes. Sweet Seeds reserves the right of carrying out legal/judicial actions against any person that performs any type of act that is susceptible to be considered manipulation or falsification of the Contest. Sweet Seeds excludes any responsibility for damage or loss of any kind that could be originated by the lack of time availability or of continuity of the operation of the service though which the participation in the Contest is possible, to the defrauding of the utility that the users could have attributed to the mentioned services, and, specially, although in an exclusive way, to the fails in the access to the different pages and responses of participation through the Internet. Sweet Seeds reserves the right to make changes that allow for a better Contest or when unforeseen circumstances does not allow to finish it in the way projected in the present bases. Sweet Seeds reserves the right to postpone or extend the period of the Contest and also the right to interpret the present legal bases. Like this, the company will be exempt of any responsibility if any of the mentioned cases occur, and refuses any responsibility for any loss or harm caused during the use of the prize. 8.- Data protection The data shared by the contestants will be treated confidentially and compiled in an automated file of personal data, being the company Sweet Seeds the owner and responsible of that same file, with social head office in C/Rev. Jose Mª Pinazo, 9 46020 Valencia con CIF B-97811616, which purpose will be the management of the present contest (and delivery of commercial information that could be of the contestants interest). Sweet Seeds assures the entire compliance of the Organic Law 15/1999, of 13 of December, regarding the Personal Data Protection when treating the personal data collected during the present Contest, especially when it comes to the attention of the exercise of the informative rights, access, rectification, opposition and cancellation of personal data from the contestants. 9.- Bases acceptance The simple participation in this Contest mean the acceptation of the present Bases, which means that the manifestation of a non acceptance of the totality or part of them will mean the exclusion of the contestant and as a consequence of it, the company Sweet Seeds will be free of the obligation obtained by the contestant.